Steam is now even more evil! That’s just not fair. Now I’m just a password and a click away from maxing out my credit card with Steam goodness. Damn you Valve! …your scheduled blog posts will continue shortly. In the mean time you can entertain yourselves here and here (I never knew Pandas were so vicious). The monster-in-law (she gave herself that name :D) is a huge fan of WWE (World Wrestling Entertainment) and as special treat we booked tickets to see it live at the M.E.N. Arena in Manchester last Monday evening. Now I quite like WWE, it’s all hammed up on TV and it’s fun to watch what with the fixed matches and daft storylines. Thing is, seen live it’s incredibly boring. What we were watching was being broadcast live to America so there were lots of pauses and breaks in between matches so it would fit in with the giant sized ad breaks they have. Plus two shows were being recorded, ECW and Monday Night RAW. ECW was on first at 7.30pm and lasted about an hour and a half, the from 9pm until just past 11pm it was RAW. Unfortunately for us we got there at 6.30pm so were there for nearly 5 hours! We also were high up the upper tier, in the middle of a row, so trying to sneak out for a bit of a stretch was difficult. It probably would have been ok without the ECW stuff, but there you go. It was cool though to see some of the actors wrestlers, such as Triple H, Shawn Micheals, Ric Flair and Rowdy Roddy Piper beating the crap out of each other. I would have liked to have seen The Undertaker, but was informed he was on Smackdown and not Raw. Oh silly me! The whole ongoing DX thing was funny and I must admit, when we weren’t sat in the dark waiting, I was impressed by the show they put on. As a one off experience, it’s good but we’ll not be going next year to see them when they’re back over in the UK (Kate wasn’t very keen on WWE to start with, so this experience has definitely put her off!). We’ll have to find the mother-in-law a tag team partner to go watch it with! Bloody brilliant sums it up quite nicely me thinks. We saw it last Friday and thoroughly enjoyed it. Certainly one of the best Bond films I’ve seen. I read that one of their aims was to make it more realistic without all the silly gadgets (such as the invisible Aston) and they’ve definitely done that. It seemed more gritty and real. The parkour in the opening sequence was excellent. I had a sneaking suspicion that Sebastien Foucan was involved and I was proved right since he is listed in the credits. Actually on a related tangent, we saw him in person when we went out for a meal in Manchester a couple of years ago. I think it was not long after Channel 4 aired a documentary on parkour. Anyhoo, going back to Bond’s beginnings as a double O worked well. I would have liked to have seen how he was recruited, but never mind. It was also a nice touch to see how Bond won the famous DB5, and whilst the plot was pretty simple it held together well. *Spoilers ahead* A banker, Le Chiffre, that deals with terrorist money organises a $150 million poker tournament in order to pay back money he’s lost. The continuity during the poker match seemed a bit off and jumped about a bit, but not enough to confuse matters. It was a nice twist to have Felix Leiter (CIA agent) make an appearance to help bail James out when he gets knocked out of the tournament. Le Chiffre, played by Mads Mikkelsen, turns out to be a really evil baddie which, as I said previously, is a must for a good Bond film. You can see he has a nasty streak from the beginning, but the torture scene really brings out the worst in him. Daniel Craig actually seems to be acting and brings more depth and character than we’ve previously seen in Bond. He seems haunted by something in his past that we’re yet to find out about. Overall, good stuff, highly recommended, probably more so if you’re not a Bond fan. Watching from here, you can start afresh. Hopefully they’ll build the series up again with the new style they’ve used. I’m really looking forward to Bond 22. So I left my laptop on last night downloading some files off FileShack and went to it this morning to find it sat there at Windows login. I logged in and the oh so helpful Automatic Updates green shield was happily sat there in the system tray proclaiming it had just successfully installed various updates. …which must have appeared whilst I was snoozing. If you click Restart Later and then leave your computer alone, it’ll automagically reboot itself. Very annoying. Yay! No more stupid automatic reboots! Info / screenshot from Coding Horror and The PC Doctor. I read about this ages ago but it looks like they might actually make it. The difference with the Optimus keyboard is that the keys have OLED (Organic Light Emitting Diode) on top, which means you can change what is displayed on each key. According to the site it should go on sell this year and cost no more than a good mobile phone… hmmm that’s a bit open to debate though. Mobile phones on a new contract with Orange, Vodafone or O2 are free… so, heh, I can dream can’t I? 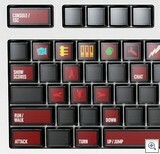 Anyhoo, other than the obvious advantage of customising the keyboard depending on what you’re doing (like for Quake, shown above, or Photoshop), you could have all sorts of fun with it. It could be linked into the music visualisation plugins you have in Media Player, Winamp etc, and have it display whacky graphics and patterns across them. The thing I’m really interested in though is the feel of it. 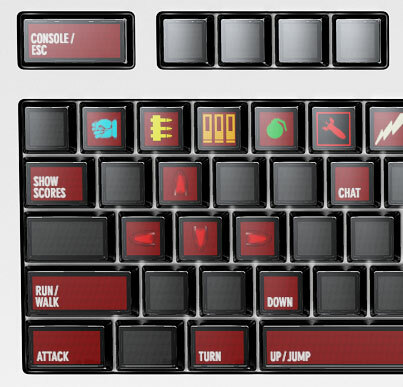 A keyboard can look great but if the feel of the keys isn’t right, it’s not worth using. Hopefully it’ll be out soon. I’ll be keeping an eye on the blog to see what progress there is. Interesting stuff this, found via Life Hacker. 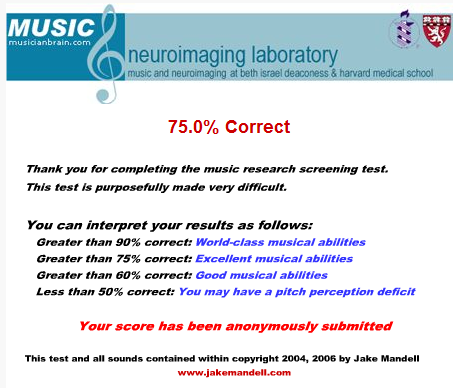 It’s a tone deafness test that consists of 36 questions. Each question plays two samples and you have to select whether they’re the same or different. I got 75% which I’m pretty amazed by given I have about as much musical talent as gold fish. Not likely! I commented on a website way back in February that wanted to boycott the now new James Bond film, Casino Royale, because of Daniel Craig taking up the part from Pierce Brosnan. Problem is they’re not going to do much of a job it if the site domain expires are they? Anyhoo, the good news is that film is out on Thursday and we’ll most likely be going to see it over the weekend. I’m a little worried though because the reaction from the “critics” has been that’s it good and as everyone knows, that usually means its crap. Critics aren’t to be trusted. The key thing with Bond films is a good baddie. If its got that, it’ll be cracking. On a slight tangent, there’s an interesting piece on BBC News about the real MI6 and how M is actually C and that Q does exist! Cool! Edit: It appears the CraigNotBond.com site has spawned DanielCraigIsNotBond.com. Yay for awful html skills. As to the lack of, you may select a reason why for me from the following list. Although they’re pretty crappy. The real reason is because I couldn’t be arsed. Find It! It’s pretty simple. You have a certain amount of time to work out what is changing in a particular picture. That’s it. I’m on the Japanese text level and it’s really hard.